When it comes to real estate, Toronto is the driving force in Canada. The city’s residential, commercial, and industrial real estate have been steady, with Toronto’s residential real estate market carrying Canada in 2018. Now it was just announced that Toronto’s retail space in malls was the most profitable in all of Canada. The Retail Council of Canada recently released their list of most profitable malls in Canada. Unsurprisingly, Toronto’s Yorkdale mall came out on top. This is the third year in a row that Yorkdale has come in first. Malls have been declining in popularity for the past few years. Many blame the rise in online shopping or increasing rent prices, but many consumers cite old stores and poor customer service. When Sears, once a staple in malls across Canada, shuttered their stores and filed for bankruptcy many feared retail real estate in malls would suffer. However, malls in Canada have continued to thrive, especially compared to US ones. In their report, the Canadian Retail Council says, “Canadian shopping centres have seen a positive trend in terms of overall annual sales per square foot for non-anchor tenants since 2010, while the United States has seen minor decreases year over year since 2015.” The report cites physical refreshes of retail spaces to keep them “experiential, creative, and consumer-centered” as a major reason why Canadian malls thrive while those in the US are suffering. This focus on innovation and consumers has been attracting international retail to Canadian malls. Major international retailers such as Uniqlo, Miniso, and Muji have opened up stores in Toronto appealing to the cities large Asian population. Domestic and international retail brands have been noticing the benefits of having retail space in Toronto for the past few years. Yorkdale alone pulled in about $1,905 in sales per square foot in 2018. This was a 15.25 per cent increase from the year before. Comparatively, Vancouver’s CP Pacific Centre makes around $1,690 per square foot. Yorkdale wasn’t the only Toronto mall to make the list either. 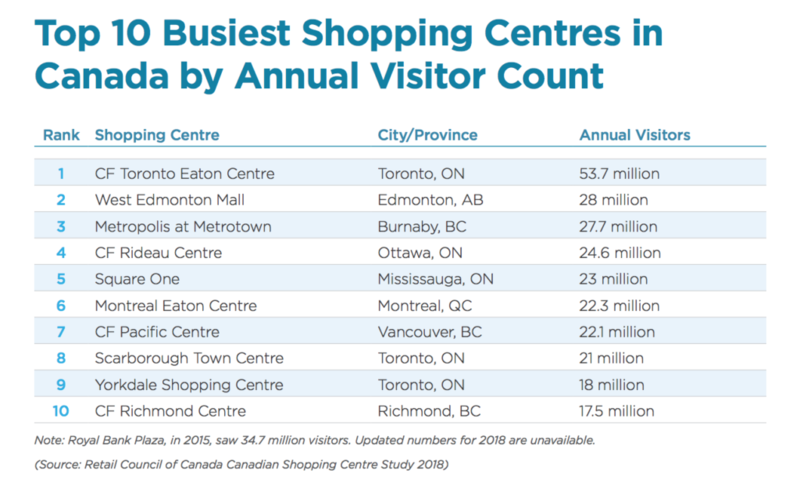 Eaton Centre came in 4th place, Sherway Gardens in 12th place, Fairview in 13th place, Scarborough Town Centre in 17th place, and Bayview Village in 24th place. The Great Toronto Area dominated the top 30 list with eleven shopping centres in the area making the list. Toronto’s retail real estate didn’t just top the list in terms of profitability either. Toronto Eaton Centre was the most visited mall in all of Canada with 53.7 million annual visitors. Mall retail real estate will only continue to grow this year. The Retail Council of Canada states that most of these profitable centres are investing in “improving common areas, adding technologies, growing amenities and expanding with different types of retailers and experiences.” The report highlights that Toronto’s retail real estate market will continue to thrive and likely continue to lead in terms of profitability.